Cleveland has the Dawg Pound. It is the place the die hard fans cheer their beloved team across the goal line. The NFL is notorious for entertaining touchdown celebrations. Some of the most dramatic football finishes have not been touchdowns, but instead were field goals from 63 yards with 2 seconds on the clock, like Jack Dempsey's famous game winning kick. These dramatic field goals would be impossible without one crucial piece of equipment; the goal post. 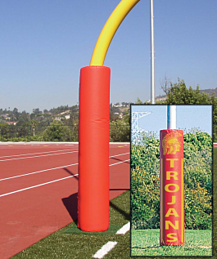 The goal post has gone through several transformations throughout the years. All of these improvements and new features are available for you and your football facility, and Toadvine Enterprises gives you the highest quality and affordability. So while your program is concentrating on the roster and recruiting, don't forget to check off your end-zone equipment needs. We carry an assortment of goals that will meet your specific needs and budget. We have many H-style goal posts, combination football/soccer goal posts, and gooseneck single pole base goal posts that come in aluminum or steel construction. We also carry the Revolution goal post that rotates 180 degrees so it does not interfere with other sports needs on the same field. If you need a new ground sleeve or plated system we can walk you through the products that will best meet your needs. Give us a call today at (502) 241-6010 and knock out your end-zone checklist so you can focus on things that really matter, like winning!